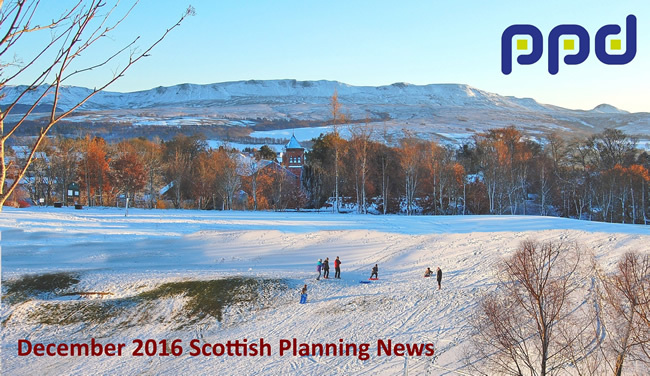 Welcome to PPD December 2016 Scottish Planning News. We wish all our clients and friends a Happy Christmas and a prosperous and successful new year. The Government gave the development industry a Christmas surprise by publishing a consultation paper which advocates a substantial increase in planning fees. The origins of this came from the independent review of the Scottish planning system which was published earlier in the year (see our June News), one of the suggestions from which was that fees for larger development proposals should reflect the fact that these applications require more staff time to process, and therefore should rise significantly. It is noticeable that none of the more positive and creative suggestions of the Review appear to have been progressed so far. The suggested new fees retain the ‘lower end’ of the present structure, but significantly raise the maximum fees. However, there would be a lower ‘per unit’ rate per increment once the present maxima had been reached. This table indicates the increases. Fee rates not mentioned would not be the subject of an increase. Thereafter £200 per 0.1 hectare up to £125,000 (maximum fee payable). This marks a change in the approach to fee increases by the Government. Previously, increases were to be justified by improved performance. Statistics released by the Government in October (see www.gov.scot/Publications/2016/07/6839) showed that major developments (those which the fee increases will most likely affect), taking 13 weeks longer than the previous period. The average decision time was 39.3 weeks, when the statutory time for a major application is 16 weeks. The Government’s approach now seems to be to allow higher fees first, then to expect better performance. This is just the start. The consultation paper states: “We will be considering wider changes to the fee structure, including scope for further discretionary charging taking account of changes to the planning system flowing from the review”. It also re-iterates the view of the Scottish Ministers “that any increase in fees must be linked to sustained improvements in performance”. Responses to the consultation must be in by 27th February 2017. “It is unacceptable that uncertainty is introduced by Council motions and late support for changes which are significantly different to the published Proposed Plan. This effectively passes responsibility to others and falls short of provide a fair and transparent planning service to members of the public who have engaged in the process in good faith”. 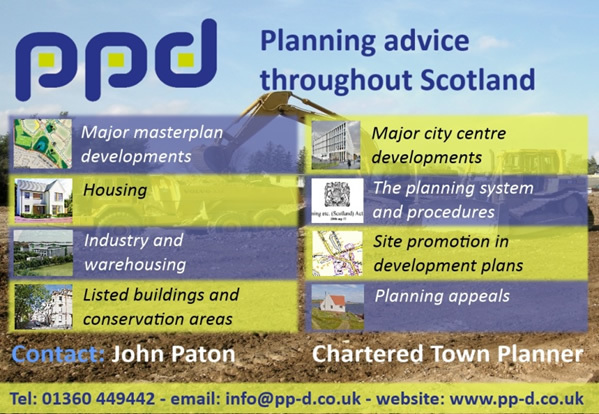 West and East Lothian, the last Local Development Plans in Scotland to be prepared, are at last progressing towards examination stage.